Two down, two to go in the 2018 preseason. Figured it would be a good time to take a peek in on the Vikings position battles. Let's start with the RB3 spot. Three running backs started this camp vying for the spot behind duo Dalvin Cook and Latavius Murray. Veteran Mack Brown, and two undrafted rookie free agent signings Mike Boone and Roc Thomas. Boone has flashed in camp, while Thomas took off in his first NFL action against the Broncos. Boone tighten the competition with some hard nose running over the weekend verses the Jags. Brown has fell behind the two rookies do to injury. Going forward, I'd say this is now a two man competition between Mike Boone and Roc Thomas with two games left to sort it out. Next up, rookie Mike Hughes and third year corner Mackensie Alexander for the nickel slot spot. This isn't a one make one cut situation, but does play a huge role on who will start in the Nickel package. Alexander has the experience, working two full seasons now in the slot. Mack struggled with the move last season. Although he still doesn't look entirely comfortable in year two. Mike Hughes comes in with a lot of good intangibles. His size seems to fit the slot better, he has great quickness to jump short routes, and has impressed me with his tackling ability. Zimmer has heaped praise on the rook for his ability to learn so much so quickly. With Alexander suffering an ankle sprain in Saturday's game(MRI today) it would seem Hughes will get work with the first team in the Nickel package in practice leading up to Friday's game against Seattle. If Alexander is out any length of time, I think the team goes with Hughes as its slot corner. Let's stay on the defensive side of the ball and move on to the linebackers group. Lots to shake out in way of depth at this level. Eric Wilson, Reshard Cliett, Devante Downs, and Antwione Williams are all names I really like backing up Barr, Kendricks, and Gedeon. Eric Wilson has stood out among these names, I see him making the 53. Beyond that it will come down to who makes the plays without the mistakes. (Or even who can remain healthy) Kentrell Brothers is in a vulnerable spot with the team. He faces a four game suspension to start the regular season, and hasn't had a good preseason dealing with an injury. The deck is stacked against Brothers, with the one saving grace is his experience among the LB depth. If the Vikes carry six linebackers I see the six being: Barr, Kendricks, Gedeon, Wilson, Downs, Williams. (Cliett could be stashed on the practice squad) unfortunately, I think Brothers is the odd man out of this group. Continuing on to the secondary, we see four players standout depth wise. UDFA rookie Holton Hill who has had an up and down preseason to this point. (Note: more good than bad) Horace Richardson who has been solid from camp on. Two other names to keep in mind are Trevon Mathis, and Tray Matthews. Both guys playing positive minutes. Not sure just how many defensive backs the Vikes will keep on the active 53, but they have some hard decisions to make. 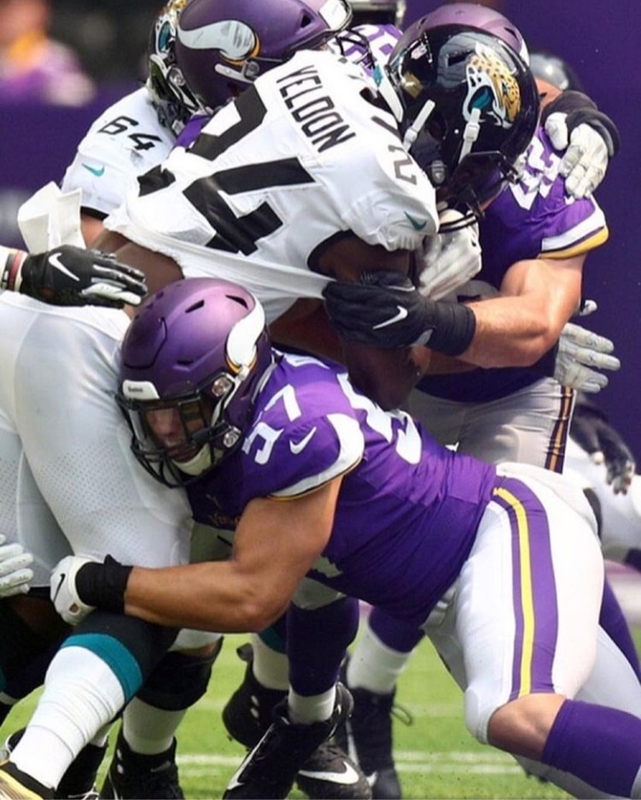 Let's not forget that other teams will be keeping a close eye on which players the Vikings release especially on the defensive side of the ball. The last group I'm looking at is the rotation up front on the defensive line. This team is deep up front, and versatile. Players like Robison, Odenigbo, and Holmes playing both DE and DT give this group the kind of quality rotation it needs for the long haul. Again, depending on how many the Vikes carry will decide just how hard the decisions will be when it comes to roster cut down. Oh, and the kicking battle. I think it ended Saturday afternoon when Kai Forbath doinked the upright on his second field goal attempt. I noticed that Carlson was in to kick the p.a.t. following the Mike Boone touchdown. Baring any melt downs, I think Daniel Carlson will be the Vikes Kicker in '18 and beyond.